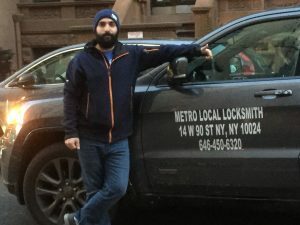 Metro Local Locksmith provides top of the line emergency locksmith services and responds to all of our clients locksmith needs: auto locksmith, residential locksmith and commercial locksmith in New York City and the upper west side. Ben standing by the newest addition to our vehicle fleet. The all new 2016 Jeep Grand Cherokee. The reason we can be any where, any time 24 hours a day is our great fleet of vehicles that enables us to travel to our costumers at any giving moment. Even with no experience of running a service business you must imagine how hard it is to control so many moving parts and making sure every morning and every night that our trucks are ready, equipped, well maintained and up and running. We make it easy on ourselves by using top of the line cars. Yes, it actually costs us more to use better, newer and more equipped vehicles but that’s what gets the job done at the end of the day. Don’t nickel and dime when it comes to your business’s transportation and your employees safety. It would be extremely embarrassing if we had to call one of our costumers in the middle of the night and tell them that their emergency locksmith is running late because our vehicle didn’t start! You can’t help a stranded client who’s stuck with no car keys or no way of getting back in his or hers apartment if you can’t get there to begin with. Being able to get to our calls in a timely manner each and every time enables us to provide quality and consistence locksmith service that is truly second to none. As always if you have any questions what so ever about any of our locksmith services you’re more then welcome to contact us at anytime with any question, big or small. 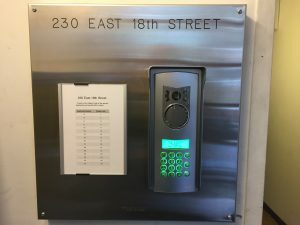 A new access control unit with a new audio and video intercom system for a co-op building provided and installed by us in the east village. At Metro Local Locksmith we provide hi-tech solution to co-ops and building owners. When it comes to your intercom and access control system you really want to go with the best locksmith out there, not the cheapest one! Security, elegance, technology and ease of use are all variables in the equation that dictates what brand of access control system and intercom unit a specific building or townhouse should get. It’s not always the most expensive system that’s right for you, it must answer your needs, starting with the very basic one and of course it must fit your budget. If you still have any questions or would like some more info on who we are, visit our home page to see what’s what and why we are different than most locksmith companies in New York. Intercom and access control system.